This is something that I would not have believed if I had not seen this with my own eyes. My son, who is now 4 years old, he used to sneeze and sneeze and sneeze. And you know when kids sneeze and that snot goes all the way from their nose down to the waist. You guys have seen that? All the way from the nose to the waist, and it was like that for months. My wife made him an appointment to go see the allergist because she said something has to be done, this isn’t normal. And then before the allergist appointment came up, we read the book Wheat Belly and Wheat Belly says, “Oh, there’s a lot of people who have allergies to wheat and they don’t know it.” So we stopped eating any wheat whatsoever at our house. And the snot from the nose to the waist stopped — completely. And if my son goes to a birthday party and he eats cake or some chicken nuggets that have breading on them, he sneezes the snot from his nose to his waist for two days and then it goes away. So at my house we eat zero wheat. The other thing is my wife, she has kind of chronic nasal sinus allergies and they bother her at night especially. And when she stopped eating the wheat, they went away. They just went away. From high school into college she was on allergy shots, and when we moved to Lubbock it got better and when she stopped the wheat it just went away. And this was something that I would not believe if I hadn’t seen it for myself. Because I was taught in medical school, sinus allergies are caused by local irritation from things that you inhale. So there’s pollen in the air, dust in the air, mites in the air, you inhale them, they get into your sinuses, they cause you to sneeze; they make allergic reaction and mucus. But I now believe that people can be allergic to a lot of foods, especially wheat is number one. Dairy affects some people – number two. They can be allergic to a lot of foods that cause chronic sinusitis, and it has nothing to do with the stuff that you inhale, nothing to do with your environment. Acid reflux — this is my wife again. So my wife is 7 months pregnant and at 7 months pregnant, a lot of women have indigestion because the baby’s taking up all the space that their stomach is supposed to go. And when she was 7 months pregnant, she lived on Tums and Mylanta – I think it was Mylanta – but anyway, Tums and Mylanta. And then during this experiment, she said “I wanna cut the wheat out.” So we cut the wheat out, she’s 7 months pregnant, the indigeston goes away. And so then a month later, she’s 8 months pregnant, she’s really big and she still doesn’t have any indigestion. Several weeks after the baby was born, she had a cookie – horrible indigestion. 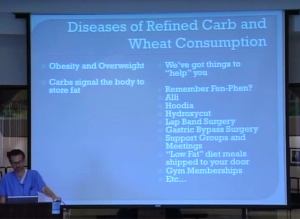 So cutting the wheat out of your diet is something that you should at least try. Because you might not know what kind of effect it’s gonna have on you. You might say you cut the wheat out of your diet, and like, “Oh, yeah, my chronic allergy’s gone away, my chronic rash has gone away, my chronic indigestion’s gone away.” If you have indigestion, there’s all sorts of pills that you can take. Or you can cut the carbs and cut the wheat. In fact I thought the tomato sauce of the pasta and pizza gave me indigestion. I was wrong. It was actually the wheat in the noodles and in the pizza crust. 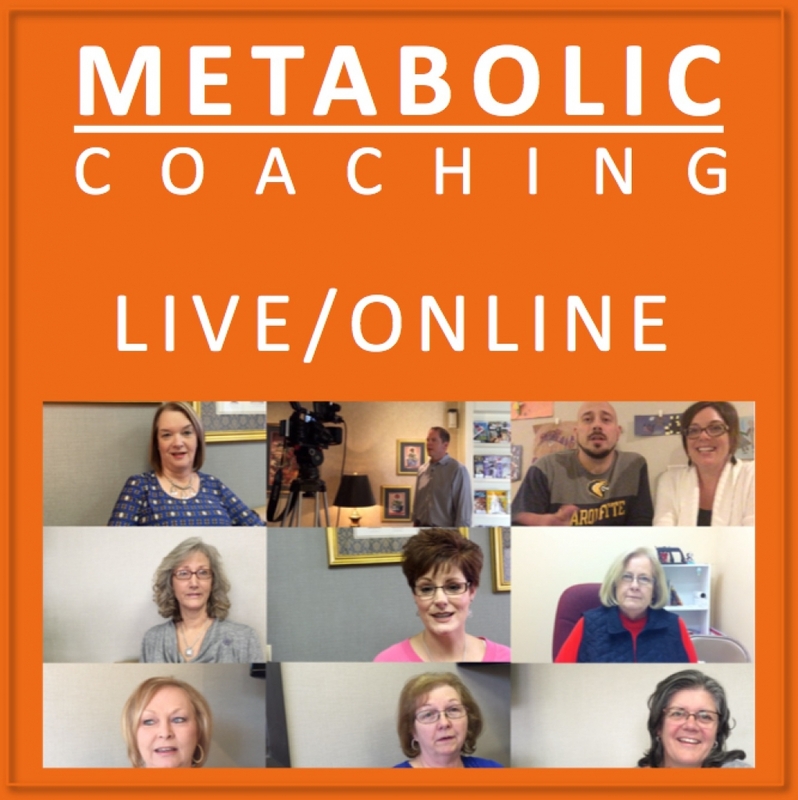 Obesity and overweight — the carbohydrates signal the body to store fat. There are all sorts of pills, and there are people who will make you a patient for life, they want you to go to meetings and support groups. Why do you need support? You shouldn’t be depressed. People get depressed when they’re on a calorie-restricted diet. You should feel great because you’re on a low-carb diet. 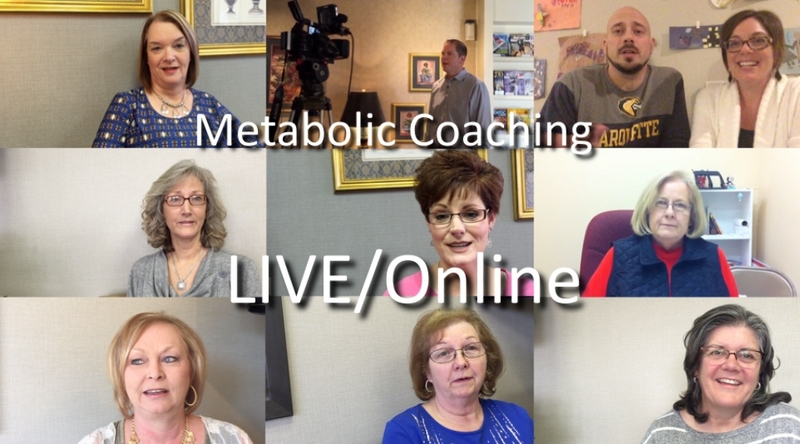 Being overweight and the associated diseases are caused by a hormonal imbalance. People don’t just eat to much, the hormones are causing you to eat too much, the insulin’s causing you to eat too much. 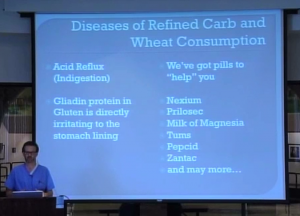 The addictive exorphins in the wheat are causing you to eat too much. This lady, she’s a Pima Indian living on a reservation, some of the poorest people in the Southwest. She’s obese, they’re poor and obese. Why? That used to be kind of a paradox to me. How could you be poor and obese? They’re absolutely dirt-poor, they have nothing. And obese, is because she survives on rations that they send to the reservation and the main rations are flour, sugar and crackers – wheat, wheat, and sugar. Doctors often think that patients can’t lose weight. And that’s because the diets that we are taught to give people to lose weight actually cause people to gain weight. Because we’re taught to give people high-carbohydate, low-fat diet. We’re taught that if you could just lose weight your diseases would improve and you wouldn’t have to take so many pills. But you can’t. Well, why can’t the patients lose weight? They can’t because the diets that we give you to lose weight cause you to get fat and they make you miserable. So what happens if you cut the killer carbs? You’ll improve all these diseases, you may be able to take less medicines and stop your medicines, require less surgery, have more energy and feel better. And that’s one reason that you have to see your doctor before you do this – because you have to get your medicines adjusted. Two reasons: number one, you have to have your medicines adjusted; number two, you may have some sort of disease where eating a low-car high-protein diet is not good for you. I met a lady, she had polycythemia, she can’t eat too much iron so she doesn’t eat much meat. Should she do a low carb diet? Probably not. People with kidney disease should not do a low carb diet because their kidneys can’t handle the protein. So you have to see your doctor. There are some people that I know that have improvement in their symptoms, we already talked about.